Summer is just around the corner and I can’t wait until it’s time to harvest some garden fresh tomatoes! There is nothing in the world that reminds me of my family and back home than frying up a plate of Fried Green Tomatoes! Everything about it just screams back home on the farm to me and what better way to remember the good old days then with an awesome plate of goodness! While you’re here you may also want to try out some of my Easy Dinner Recipes! We are all about good old-fashioned cooking around here but if it can be done quick, it gets a 5-star rating in our home! We have two children to play with after all! Old-fashioned and quick is the way to be this day and age! My favorite pan to cook this recipe in is………. *drum roll please* …… the Cast Iron Skillet!! As Grandma used to say, It’s the only pan with the flavors built right in!! It’s my go-to pan for any type of cooking and works especially well when making Fried Green Tomatoes! 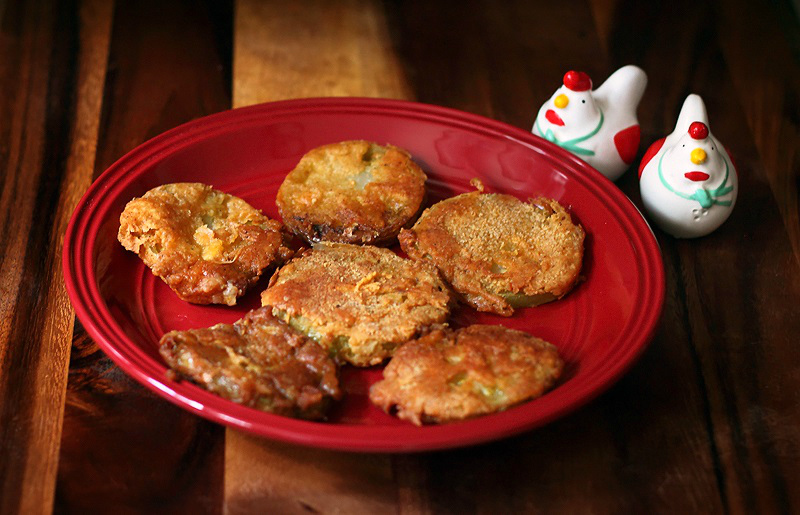 The warm summer sun, walks in the neighborhood, swimming with the kids and Fried Green Tomatoes! 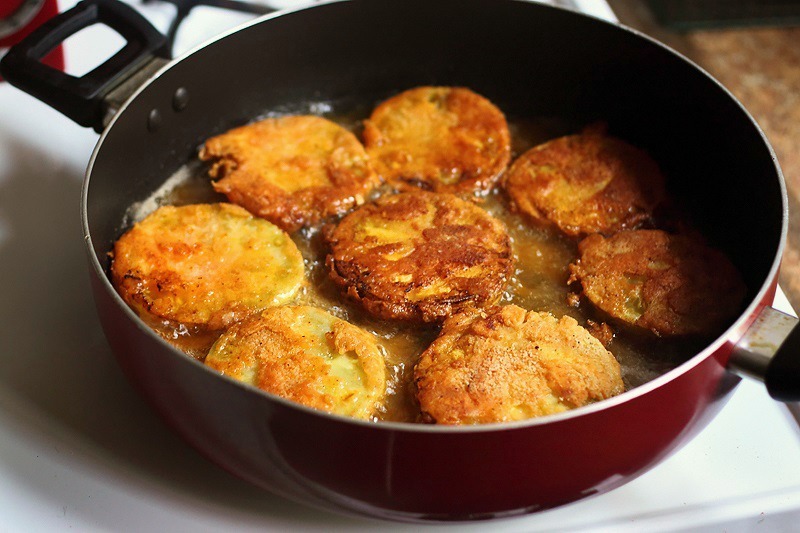 Oh, how I want some luscious mouth watering fried green tomatoes!! When I plant the tomatoes in the garden I plant them for this reason only. 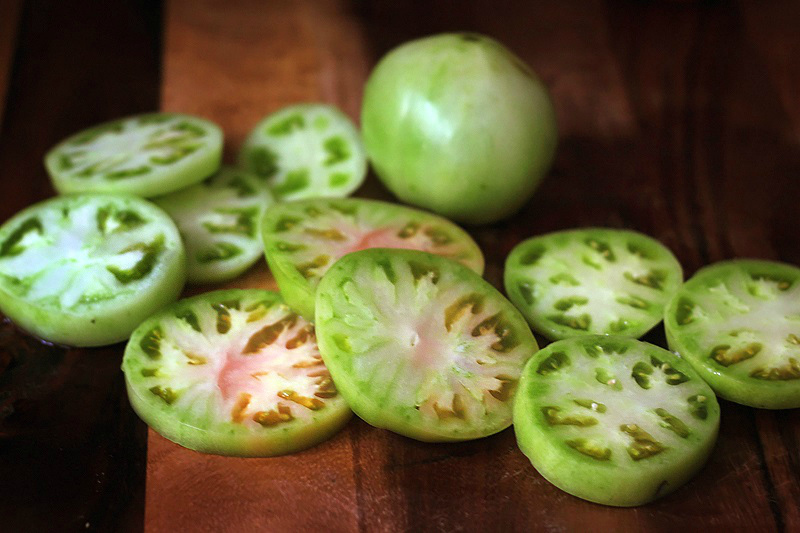 Sure they are great when they are ripe and juicy on a BLT sandwich or with cottage cheese but nothing……..I mean NOTHING beats a good batch of fried green tomatoes. Wash and cut tomatoes into 1/2 inch thick slices. Lightly salt both sides and leave on rack or paper towels for 15 minutes to draw out some of the extra water in the tomatoes. Pat dry with a paper towel. Whisk eggs in one bowl or dish for dipping. Combine flour, cornmeal, salt, pepper and cayenne in a plate or shallow dish. 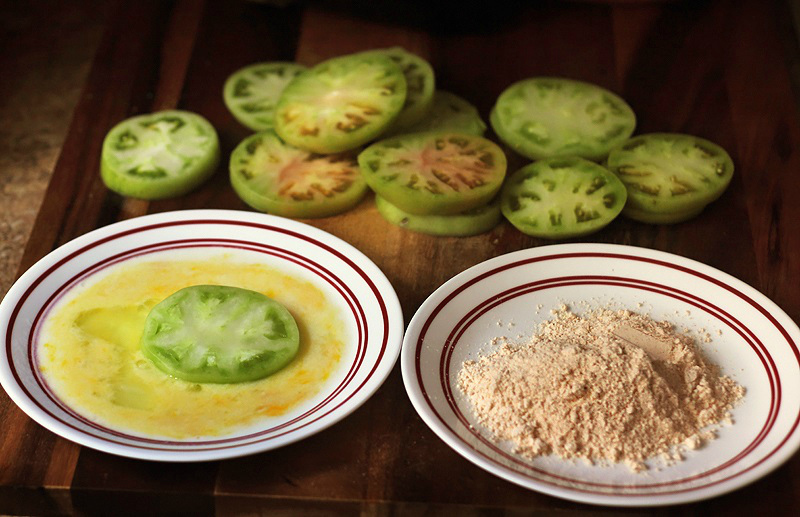 Dredge tomato slices in flour mix, then dip in egg, then dredge again in the flour mixture. Fill pan up to 1/2 inch depth with peanut oil and heat on medium high (375 degrees), adding butter to the heating oil. Add tomato slices to heated oil, browning on both sides for approximately 3 minutes. Remove and place on paper towel to drain excess oil. Serve as is, or try these with ranch dressing or a spicy remoulade, such as Tony Chachere’s Zesty Sandwich Spread. I’m not sure where to get a green tomato, but I have to say that they look pretty good!! They are hard to find right now. 🙂 If you know of anyone who plants their own tomatoes just have them grab you a few before they are red and ripe. I’ve never actually had fried green tomatoes but I sure would like to try them!! They look delicious! Great photos! This Southern girl loves fried green tomatoes. I will have to try this recipe sometime. I always order them for appetizers at restaurants but have never made them myself. I just pinned this. My husband loves fried green tomatoes and they are really hard to find in our local restaurants. We used to get them at Cinebarre (an eat-in movie theater near our house), but they stopped carrying them over a year ago! The pictures are absolutely beautiful!! The FGT look divine!! I’m going to have to make some!! They turned out beautiful! I do not eat fried foods, but my grandmother has cooked these often, hers just never looked so pretty! Had these at my bbq wedding! So delicious! Such a hit. Love the supporting images and roosters, too! There was a time I never would have tried these, but my gosh those look good! I would definitely go for it now! Yummy! Those look really good. I’ve never tried to make them myself. I love fried green tomatoes! I’ve had them a couple of times, years ago. The pics of yours look so tasty! be still my heart – these are my FAVORITE. Add a dollop of goat cheese and I’m SOLD! I just love fried green tomatoes! This is totally inspiring me to make some ASAP! Gosh, these look so delicious! I tried friend green tomatoes for the first several months ago and I wasn’t a fan. I wonder if I make them myself if I’d like them better? I’ll have to give it a go and see how they turn out. I’ve never made fried green tomatoes. I do like to eat them, though! This recipe looks simple enough. I LOVE tomatoes.. but can you believe I’ve never had fried green ones?! It’s time I try them! my husband wants to grow green tomatoes in our garden this year. ONLY for making fried green tomatoes!! Never seen a green tomato, only ever heard of one from the movie of the same name! Looks good! I have not had fried green tomatoes, but they do look delicious. I may just have to make these! Even though I grew up down south, I have never had a fried green tomato. I’ve never had an opportunity to try these, but they look good. I wonder if I can get green tomatoes around here. I’m so not a fan of tomatoes. But, every time I’ve had a fried green tomato, I really enjoyed it. These look amazing. I have just died. I love fried green tomatoes! Those green tomatoes look so delicious… I was surprised how yummy they taste when I first tried them in a cafe… delicious photos too. We make the same recipe. I’m addicted to fried green tomatoes. They’re so good. You brought back memories. I haven’t had these in years. I think I will good some this weekend. I’ve never tried these but they look good. I have thought tried fried pickles and they are yummy. I love, love love, fried green tomatoes! Thanks for sharing this! These look DELICIOUS!!! Would you believe I have never tried them? I sure want to now! LOVE fried green tomatoes! Also try slicing cucumbers lengthwise, a little thinner than 1/2″, and frying them the same way. They taste almost exactly the same! Pretty amazing. Easy to get when tomatoes are out if season and you get that craving. Seriously. try it! Checking out Monday’s Time to Sparkle Party and thought these looked delicious! Can’t wait to try in my own kitchen. Thanks for sharing and have a fabulous day! I’m excited to try these! I am growing a striped green tomato this year…I can’t remember the variety name…but I am going to try your recipe once I have them! I love tomatoes! If you have a moment, I would love it if you would link them up with us at Foodie Fridays. I L.O.V.E fried green tomatoes! I haven’t had them in FOREVER! Stopping by from Mix It Up Mondays…thanks for sharing! Fried green tomatoes are SOO good, I’m totally trying out your recipe. Pinned! I’ve always wondered how these were made ingredients and all…this looks good! I’ll have to try it…thanks for sharing! Ah! I LOVE fried green tomatoes! My tomatoes are just coming in. 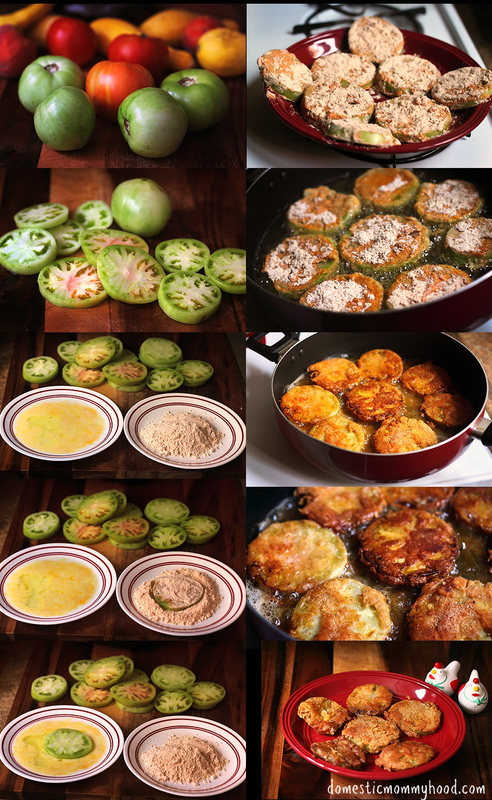 I normally reserve fried green tomato making for the end of the summer, when I have to pick off the remaining green fruits, but your photos are mouth-watering, and I might have to make some now! We are harvesting Swiss chard — made a delicious crustless Swiss chard quiche you might like. I love fried green tomatoes!! This looks fantastic. I have a lot of green tomatoes to do this with!! Hi there! Visiting via Someday Crafts Linky Party. Ever since I saw the movie I wanted to try making these, so this recipe comes in super handy 🙂 Now I just have to find some green tomatoes in the UK 😉 Thanx for sharing! My mouth is watering from looking at those pictures! I have a desperate craving for fried green tomatoes now. These look so delicious. Thank you for linking at the In and Out of the Kitchen Link Party. Hope to see you again next week. This is my absolute favorite thing about late summer. Thanks for reminding me to make them! I would be honored if you would come share this awesome post at Pin Your Friday Favorite! The party goes live tonight @ 10pm EST. I’ve been wanting to make this! I was going to try it with my green zebra tomatoes but there is something funky going on with my plant and the bottoms keep rotting. It is so bizarre. I might have to wait for the green tomatoes to show up at the farmer’s market! Pinning though…this looks delicious! Visiting from Foodie Friends Friday! These make me want to watch the movie and cry then eat some of these delicious tomatoes!Thanks for sharing at What’d You Do This Weekend. G’day! Thanks for stopping by our #SayGdayParty! Love fried green tomatoes! Pinned! Please remember to stop by and comment on other people’s submissions too and of course, hope you are following Natasha and me on Pinterest! Comments and shares show you care! Hello,Had these at my bbq wedding! So delicious! Such a hit. Love the supporting images and roosters, too!